Around 20,000 people were evacuated Thursday in Ukraine's Kharkiv region near the border with Russia. KIEV: Around 20,000 people were evacuated Thursday in Ukraine's Kharkiv region near the border with Russia after a massive fire at a military arsenal. 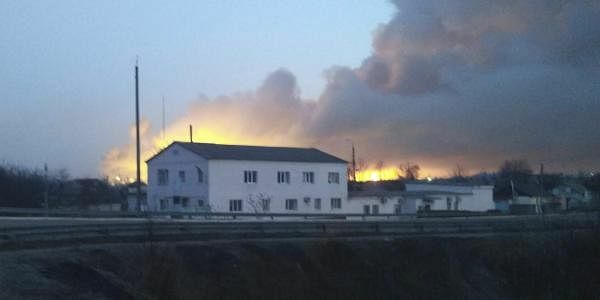 The fire at the depot in Balaklia, which holds large-caliber artillery rounds and is one of Ukraine's largest, erupted early Thursday, prompting the evacuation and Prime Minister Volodymyr Groysman to fly to the area to monitor the blaze, which is still raging. An area the size of 40 kilometers (25 miles) around the depot has been closed for flights. Ukrainian Defense Minister Stepan Poltorak said at a briefing that the fire had likely been staged by Russian or separatist saboteurs who probably used a drone. Poltorak said there was no immediate word on casualties. The separatist authorities in Donetsk and Luhansk have rejected Poltorak's accusations, arguing in statements carried by the Interfax news agency that the blaze was likely rooted in corruption and incompetence among the Ukrainian military. There was a fire at the same arsenal in 2015 but the military managed to quickly put it out before munitions started detonating. The huge depot held about 138,000 metric ton of ordnance. Ukraine's chief military prosecutor, Anatolii Matios, also said on Facebook that the blaze was sparked by an act of sabotage and dismissed charges that the fire was an attempt to cover up ammunition theft from the depots, saying it had been protected by nearly 1,000 guards. The Kharkiv region lies just north of the Donetsk and Luhansk regions, where Ukrainian troops have been fighting Russia-backed separatists. The conflict has killed more than 9,800 since April 2014. Ukraine's defense ministry said controls on the border with Russia have been tightened.